The Amplify Live roadshow rolled into Sydney last week, delivering fans at Luna Park a swag of hot fresh, young online talent and pop stars like Warner Music signing – and ‘X Factor’ favourites – In Stereo. New Sydney reviewer Brad went along. ‘Amplify Live’ (billed as a “festival for the connected generation”) toured around Australia and NZ this month, showcasing the internet’s latest viral sensations. Boasting a combined social media reach of 80 million followers, the party did not disappoint its teenage audience. Each act was allowed a brief moment to engage with the crowd, some showcasing their talent as DJs or singers, whereas others entertained by competing in a Lip Sync Battle or a 7 Second Challenge. 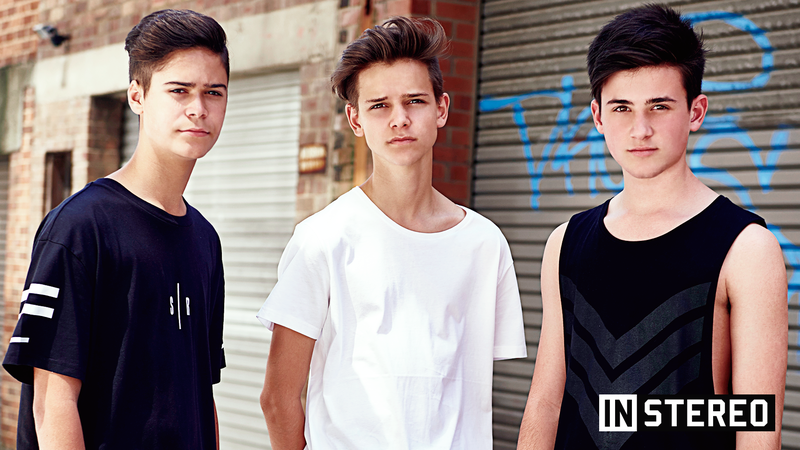 Amongst an impressive lineup featuring Tyler Oakey, Kian Lawley and Kurt Coleman, we were particularly excited to see how teenage heartthrobs In Stereo had evolved as a band since their ‘X Factor’ appearance last year. Fresh from their No.11 debut on the ARIA albums chart, the boys made a quick stop at Luna Park as part of their ‘Honest’ tour, a tour that also saw them sell out Sydney’s Oxford Art Factory in just four minutes! Jakob, Ethan and Chris sure know how to work the crowd; it came as no surprise that anything they said was met with instantaneous high-pitched screaming – something we became accustomed to during the ‘X Factor’ competition. But these boys proved to be more than just their charm or looks, with the crowd singing along to the tracks featured on the ‘She’s Rock N Roll’ EP. What was particularly impressive was the pure pop sensibility in its songs. ‘Good Times’ could easily fit on radio, charming young listeners with lyrics like, “Rules are made for the breaking, I wanna break all of them with you. If the world’s for the taking, theres nothing we can’t do”. The girls were melting through the audience as they sung along. The highlight of their set however was their single ‘Honest’, recorded with James Yammouni of the Janoskians fame. After Ethan instructed the crowd to bounce and drop when the chorus came on, they did – and didn’t stop, jumping and singing along to every world. The set was a stand out performance amongst the other Amplify acts and was a great opportunity for the boys to expand their fanbase. After watching their exclusive Facebook web series, it’s clear the boys’ determination will see them prevail in the long run. We were impressed by the sassiness of Kurt Coleman and the three-song performance by Trevor Moran. Kian Lawley and JC Caylen wasted their time on an elaborate boxing entrance and were quizzed against one another. Jamie Curry competed against the beautiful Andrea Russett in a blindfolded food game and 7 Second Challenge. MyLifeIsEva was adorable, dancing throughout her DJ set, before joining four male YouTubers in an hilarious Lip Sync Battle. However the highlight amongst the rest of the acts had to be Tyde Levi, who closed the show and truly “amplified” the room. Headliner Tyler Oakley told a hilarious fan fiction story that plugged his Snervous brand, mentioned other Amplify acts and expressed his love for Zayn Malik. Whilst it was great to see Tyler be his charming self, we couldnt help but feel disappointed that this was meant to be some sort of highlight for the show. Unless you were familiar with the many viral stars, the appeal of the Amplify Live tour may have been somewhat limited. Lucky for the crowd, this wasn’t a problem.